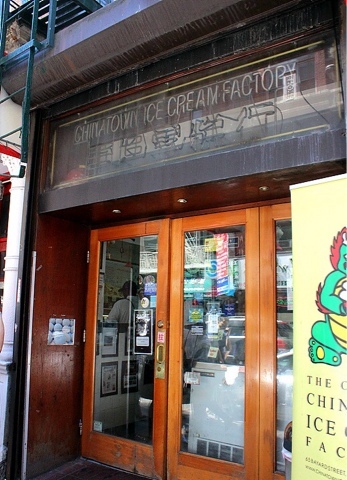 The Chinatown Ice Cream Factory is a great place to go after meals or various tourist activities (ie. shopping in SoHo, walking the Manhattan Bridge, taking a longer walk after the Brooklyn Bridge). Expect a bit of a wait, but it'll definitely be worth it. 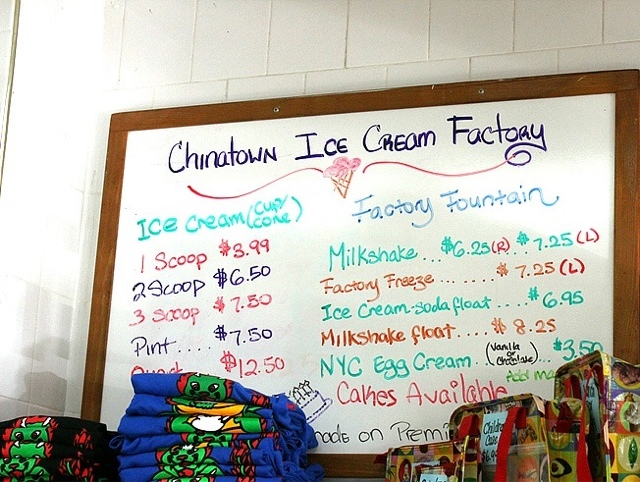 Some of the best Asian-flavor ice cream in New York City! Make sure to get a sample of any flavor you are curious about! I apologize that I have n pictures of the actual ice cream I ate. I forgot to take a picture of it - I was flustered because of the crowd and my ice cream began to melt because of the heat. All in all, bad picture-taking conditions of the delicious ice cram. You can get one scoop for $4. 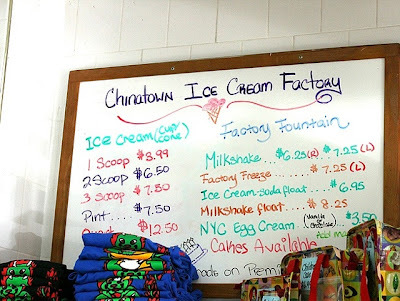 Kind of expensive compared to other places in the City, but the ice cream is homemade and the scoops are generous! If you get a one scoop cup/one, you can usually request half one flavor and half another flavor. I recommend sampling the various flavors if you are unfamiliar with some of the unique flavors. I think there are a few rotating flavors, but, honestly, I knew which flavors I wanted to get when I walked in the door. I really like these flavors: Black sesame, lychee, taro, Thai tea, green tea. The lychee is made of real lychee, so it is very fruity and sweeter than most of the other flavors I listed. If you've never had lychee before, its this little heart-shaped fruit that is reddish on the outside when ripe and the flesh is white. The flavor is kind of a cross between a pear and plum (not a good description), but the texture is kind of like a grape. I recommend this one as a good starting flavor for someone just trying Asian flavors for the first time. The black sesame is a very Asian flavor. It is not sweet at all and has a kind of gritty texture. I recommend mixing this flavor with a more sweet flavor. Taro is the purple ice cream. It is one of my favorite flavors of almost anything dessert-y (ie. ice cream, pudding, bubble tea). The flavor is also kind of difficult to describe. In my mind, it is kind of like an Asian sweet potato flavor. Thai tea is a wonderful orange color. It tastes very sweet (I would recommend mixing it with black sesame to cut the sweetness). Thai tea is concentrated black tea sweetened with sugar and condensed milk. There is no special texture to this flavor of ice cream, just very creamy. Green tea here is homemade. 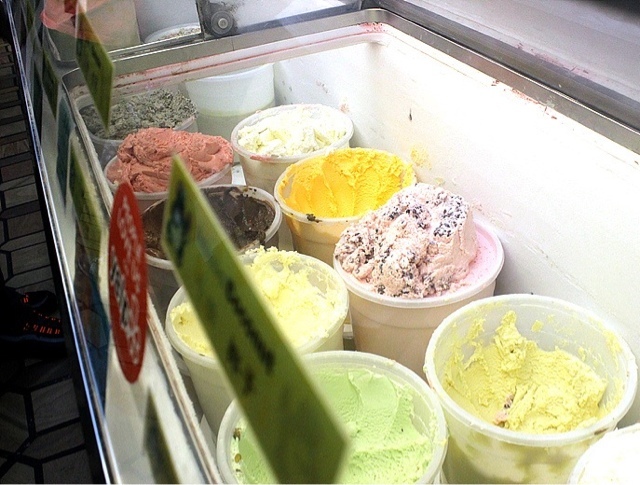 Unlike green tea flavors that you can get at Haagen Dazs or the like, it is not artificial and the color is not as dark. It is also not as sweet as the other brands' green tea flavors. I recommend this one as a good starting flavor for someone just trying Asian flavors for the first time. I took my parents to Chinatown Ice Cream Factory when they were in NYC for my graduation from Columbia. My mom got the cookies and cream-equivalent (maybe Oreo) flavor. I cannot remember the exact name. She really enjoyed it. She mentioned how fresh it was. I tried a little, but it was a bit too sweet for me. My dad got the almond cookie ice cream. He was also very pleased with his choice. Luckily we were each able to choose a flavor that matched our taste preferences and personalities because of the wide variety of flavors from which we could choose. If you go and have the opportunity, make sure you at least get a sample of the egg tart and the soy sauce flavors. I have always been curious about these two flavors. Oh yeah, reminder again, it is CASH ONLY!! Check out other Chinatown posts!